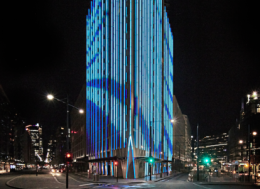 The 40-storey tower at 888 Collins Street in Docklands will be lit up nightly in Melbourne’s first real-time weather light show, designed by Bruce Ramus. 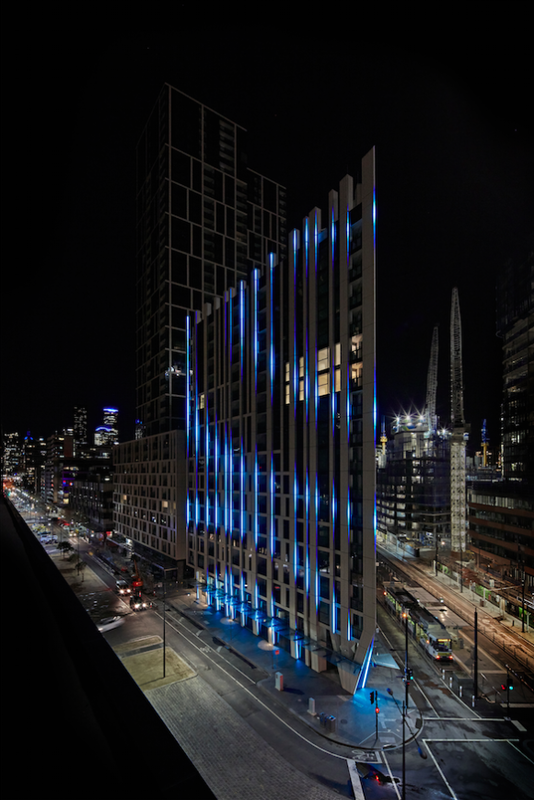 Lines of LED lights cover the Lendlease building’s façade, changing to reflect the weather forecast, presenting wind, rain, and soaring summer temperatures through a spectacular show of light beams. The interactive lights reflect environmental conditions based on real-time data, sourced from a weather station on the roof of the building that combines with the Bureau of Meteorology’s feed. Photograph courtesy of Lendlease, by David Russell. The lights run from dusk until midnight each night, forecasting the following day’s weather for five minutes on the hour. For the remainder of each hour, an abstract light movement reflects the way the weather ‘feels’ at the time and is constantly but gently changing. From midnight until dawn the feature then goes into a static phase that reflects the moon patterns. 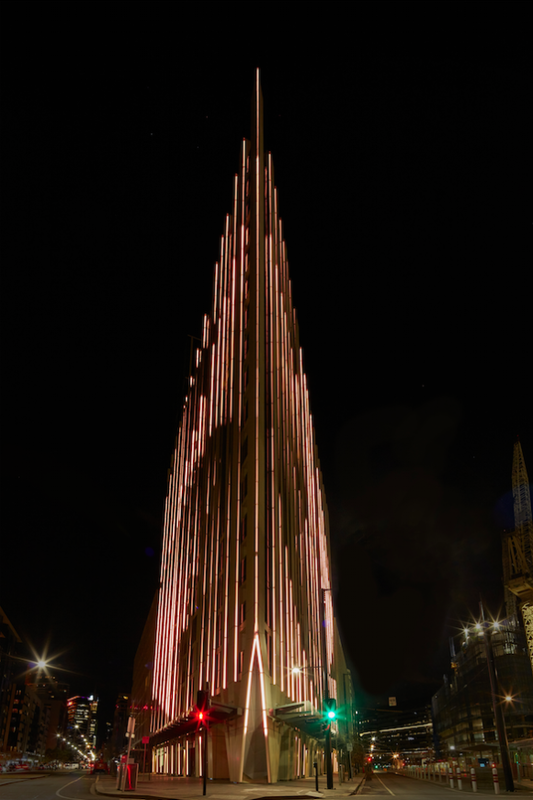 The display was designed by Canadian-born Bruce Ramus, whose resumé includes designing the world’s largest permanent interactive light installation, Luminous at Darling Quarter in Sydney, as well as lighting designer for U2, R.E.M., James Brown and David Bowie. Lendlease’s Project Director for Victoria Harbour, Tim Campbell, attended the switching on of the display last week. “The blend of innovation in technology, public interaction and sustainability aligns with our vision for Victoria Harbour. The light feature is not only visually stunning – it’s 100 per cent powered by solar panels on the roof of the building,” he said. The display features 2.4km of custom designed and fabricated LED lighting fixtures, embedded into 35 vertical fins that flank 5,500m2 of building façade, and reach up to 50 metres high – visible from as far as the Bolte Bridge. This story was originally published on the Australian Design Review.